What are the best seats in the Newcastle Metro Radio Arena? 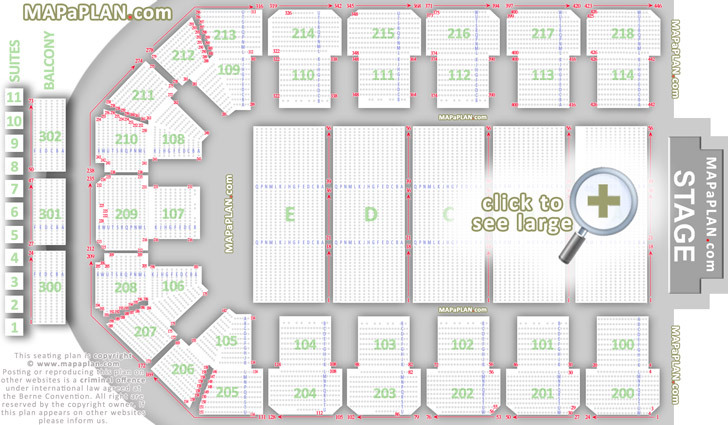 In the end-stage configuration the best seats in the Newcastle Metro Radio Arena (formerly Newcastle Arena and Telewest Arena) are the front rows in floor section A. Floor rows are numbered A-Q. Sections B, C, D, E are OK however all floor seating is set on a flat floor so if a tall person is sitting (or standing) in front of you the view may be slightly obstructed/restricted. The seats are numbered from 1 to 56 so try to find tickets as close to seat #28 for an optimum central view of the stage. Tiered seating offers great seats as well, especially sections 100, 101, 113, 114. Row lettering is A-K in 100s, then L-X in 200s. There are 3 balcony sections (300, 301, 302) locatated exactly above blocks 208, 209, 210. The balcony blocks have 6 rows lettered A-F. Additionally, behind the balcony there are 11 VIP Executive Suites that can hold 10-14 guests. What are the block numbers in the Newcastle Metro Radio Arena? How are the rows numbered in the Newcastle Metro Radio Arena? The rows in the flat seating blocks are numbered in alphabetical order with each of the floor blocks (A, B, C, D, E) having rows from A to Q. 100s (First level blocks) have rows A-K.
200s (Second level blocks) blocks 200, 201, 202, 216, 217, 218 have rows L-W. Blocks 203, 204, 205, 206, 207, 211, 212, 213, 214, 215 have rows L-U. Blocks 208, 209, 210 have rows L-X. 300s (Balcony blocks) have rows A-F.
What are some of the biggest acts that will be performing or have performed in the Newcastle Metro Radio Arena?